Selective, orally active cyclooxygenase-2 (COX-2) inhibitor. Produces potent analgesic, anti-inflammatory and antipyretic activities in vivo . Reported to produce fewer gastrointestinal side effects than standard NSAIDs.牋. Nimesulide is a relatively COX-2 selective, non-steroidal anti-inflammatory drug (NSAID) with analgesic and antipyretic properties. It is indicated for the treatment of acute pain, symptomatic treatment of osteoarthritis and primary dysmenorrhoea in adolescents and adults. However, due to the risk of causing hepatotoxicity, it should not be taken long-term. It has also been withdrawn from the markets in many countries. It mechanism of action is through targeting on various key mediators in the inflammatory process such as COX-2 mediated prostaglandins, free radicals, proteolytic enzymes and histamine. 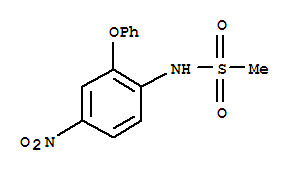 Labelled Nimesulide (N477500). Antiinflammatory agent. Preferentially inhibits COX-2 over COX-1. Suppresses chemical-induced carcinogenesis in mice and rats. Inhibits LPS-induced TNF-α production. For the treatment of acute pain, the symptomatic treatment of osteoarthritis and primary dysmenorrhoea in adolescents and adults above 12 years old.